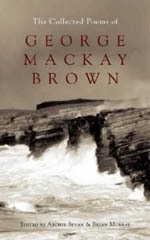 Of all the poets of the second wave of the Scottish Literary Renaissance, George Mackay Brown was unique in working in each of the main literary genres and producing a significant body of work in each. Of course, principally a poet, GMB was also a novelist, playwright, short-story writer, essayist, librettist, writer of stories for children, and journalist. Like MacDiarmid, GMB began his career writing for newspapers. For more than fifty years, from 1944 to the week before his death in 1996, GMB wrote regular columns for Orcadian newspapers; at first, articles, news items and book reviews for the Orkney Herald, which folded in 1961; then for the Orcadian, in which hundreds of his ‘little articles’, many of them ‘prose-poems’, appeared. Except for a period in the 1960s, GMB wrote almost every week for one newspaper or another. Some of the later little articles in the Orcadian were collected in three separate publications, Letters from Hamnavoe (1975), Under Brinkie’s Brae (1979) and Rockpools and Daffodils (1982). From the publication in 1959 of his second volume of poetry, Loaves and Fishes, to Voyages in 1983, GMB had a long association with The Hogarth Press, later Chatto & Windus, under whose imprint appeared his Poems: New and Selected, in 1971, and his Selected Poems, in 1977. Thereafter, John Murray took on GMB and published his Selected Poems of 1954-1983, and again those of 1954-1992, as well as single volumes of poems and short stories, and two late novels. In 1985, this extraordinarily shy and retiring man, who was mostly reticent about discussing his own writing, produced a volume of autobiography, which he did not want published during his lifetime. Thus it was not until 1997, a year after his death, that John Murray published For the Islands I Sing. It was reprinted in the same year. (The title comes from the first line of the ‘Prologue’ that opens his first volume of poetry, The Storm.) It should not come as a surprise that the publishers described the biography as being ‘as deft as it is ultimately uninformative’. Although Alan Bold wrote a critical study of GMB in 1978, he was to continue writing for almost another twenty years, and Interrogation of Silence by Rowena Murray and Brian Murray (John Murray, 2004) can be regarded as the first comprehensive study of his work. In 1999, John Murray also published Northern Lights: a Poet’s Sources, and in 2006 they will publish the first ‘authorised’ life – Through the Eye of a Needle, by Maggie Fergusson, to whom GMB gave his reluctant blessing. It was at Midsummer this year that John Murray published the first collected edition of GMB’s poems, edited by his literary executors, Archie Bevan and Brian Murray (co-author of the Interrogation of Silence). It must be said that as a publisher, John Murray is particularly faithful to the memory of GMB and to his work, having also published other posthumous volumes of his poetry. For anyone who is to become a writer, the school years and the early influences are formative, and GMB wrote about his childhood in his autobiography, in an essay entitled ‘The Writer’s Shop’ which appeared in 1976 in Chapman, 16, and again three years later in Maurice Lindsay’s book As I Remember: Ten Scottish authors recall how for them writing began. In each of these, as in other essays, GMB is sparing in his discussion of anything that might seek to describe literary precociousness, let alone early genius. Having lamented elsewhere that ‘God is out of fashion these days’, in a Chapman, 84, interview with William Shipton, GMB did acknowledge that his gift for writing was perhaps God-given, and said he was so glad that he had been given that one talent, because there was nothing else he could do very well. In Interrogation of Silence, Murray and Murray quote from GMB’s ‘Commonplace Book’, a notebook for the years 1944-46. Written in the third person and looking back to some years earlier, ‘he began to make loose rhyming quatrains about the town and its environs, praising its beauty. The phrases and stanzas … formed themselves easily and naturally in his head: he brought them out delighted, repeated them, remembered them, and stored them back again in his head. Later, after football, he went home and wrote them down on scraps of paper, carefully remembering the stanzas. He was perhaps nine or ten years old, and this was his first poem … But it was six years before he wrote another.’ Whether this first poem is the ode to Stromness alluded to by the anonymous obituarist of the Times, whether other juvenile poems by GMB exist or existed, are matters that perhaps Maggie Fergusson will address in her forthcoming biography. According to his autobiography, For the Islands I Sing, it was in 1941 that he began to write poems, and ‘none of them, fortunately, survives’. It was not until some years later that GMB’s career as poet took off, after his career in journalism had begun and following his first stint at Newbattle Abbey College, to which he had been invited to study by Edwin Muir, and at which he was to edit the college magazine, the Sun. The following year, 1952, Muir sent GMB’s poem ‘The Exile’ to the New Statesman, and when he went to the USA shortly after, he arranged for some of GMB’s poems to appear in Harper’s Bazaar. GMB’s first collection, The Storm and Other Poems, appeared in 1954. Published at his own expense by The Orkney Press in a print-run of 300 copies, and with a foreword by Edwin Muir, the edition sold out in two weeks. It transpires that, ‘within a fortnight the type had already been dismantled, leaving no possibility of a reprint’; those readers who possess this volume have a very rare copy indeed. Critically speaking, The Storm as a first publication did receive friendly if short reviews in the press, eliciting praise from Eric Linklater, Neil Gunn and E.M. Forster. The support that GMB received from the Muirs has been well-documented, but Muir’s greatest act of kindness was to send GMB’s poems to The Hogarth Press: GMB’s first knowledge of the matter was when he received a letter from the legendary editor Norah Smallwood, who said she would like to make a book of them – ‘so I got a hard-back publication without an effort on my part – a unique experience in literature, I should think’. Half a century after GMB published at his own expense his first volume of poetry, John Murray has now produced a very fine edition of the Collected Poems, so bringing ‘safe to haven’ the work of this very remarkable poet. Praise tinker and saint,/and the rose that takes/its fill of sunlight/though a world breaks. May this Greenland child/Be holding an orange and a loaf in her hand soon./May this child from wars far east/Get a fish in his thin yellow hand./Twins in a burnt African forest/In a cold wind/Look, a van has driven their way/With coats, blue and green./I think, some sunset/A child dumb with grief/May be given a guitar,/Then all children in need/Dance under the stars/Till the bread-burdened sun rises. The Collected Poems of George Mackay Brown, edited by Archie Bevan and Brian Murray, is published by John Murray (ISBN 0719565537 HBK £35).